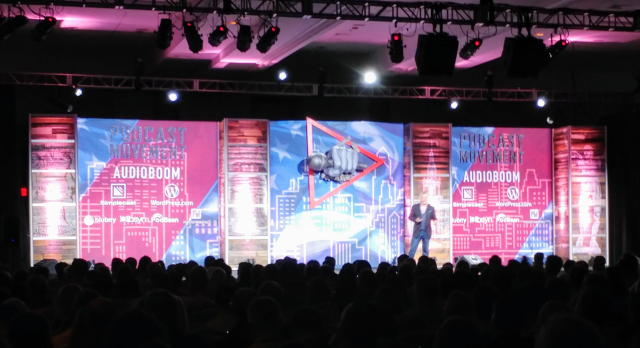 In our third year covering Podcast Movement’s gathering of creators, the world’s largest gathering of podcasters, we saw a growing seriousness and increased emphasis on professionalization. Crowds of attendees packed into keynotes by Tom Webster (Edison Research) and Zack Reneau-Wedeen (Google), while SRO audiences crowded onto every square foot of floor space for discussion panels. A purported 2,200 attendees flocked to Philadelphia, most of them podcasters, to network and learn from thought leaders in the space. Ten simultaneous stages presented content ranging from wide-appeal research presentations and interviews to deep dives in niche subjects such as audio editing and best practices for fiction podcasts. At an event with about 130 staged sessions and about 20 receptions and meetups, attendees are faced with plentiful choices, and sometimes difficult one. In addition to recognized names from pureplay podcasting (Rabia Chaudry, Undisclosed), there were media and executive celebrities in speaking roles — e.g. Terry Gross (WHYY’s Fresh Air) and Jarl Mohn (CEO, NPR). In discussions with speakers and attendees, we heard a new balance of hope and realism, which might be termed the opposing psychographic demos of the podcast creative class. Podcast Movement was founded on the idea that anyone can do this thing, and the sky’s the limit. Both are still true — but the reality is modulated by a massively crowded space (~500,000 podcasts) and the consolidation of success in a small number of high-leverage podcast networks. That power/success structure is endemic to every media category. In podcasting, high quality tools are available, as are new paths to money-making. So hope can appropriately flourish, tempered by a more complete understanding of the levers which determine success. Around the periphery of the main event (more accurately a few floors below it in the lobby of the Marriott Downtown Philadelphia), was a B2B layer of execs from podcast networks, tech companies, ad networks, and other connected business categories, engaged in day-long strings of meetings. In our talks with this set, the most recurring word was data. The methods by which podcasts are measured, and podcast advertisements are delivered, is top of mind in many conversations. Advertisers, who drive the money in this business, need a standard of listening measurement, articulated audience targeting, and campaign technology which can optimize execution and delivery. On the other side of those priorities lie the powerful inducements of host-read sponsorships to topic-defined audiences — a long-standing low-data model that can deliver great results, and is still favored by some of the most powerful podcast institutions. Podcast Movement 2019 is scheduled in Orlando next August.